Every customer is a potential reporter, and every employee is a potential spokesperson. Business has changed more in the past three years than in the prior 30. But it’s not a threat, it’s an opportunity. The NOW Revolution shows you how. 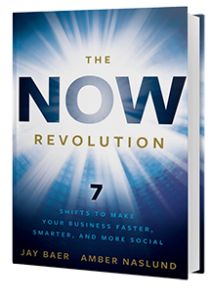 The NOW Revolution is a transformational keynote presentation, because it puts social media into a historical, cultural, and operational context that businesspeople (even execs and non-technical types) can understand, appreciate, and implement.